Some of our baby rabbits having a blast in the "Bunny Wagon"
The Bunny-Back guarantee: we breed our rabbits for personality and temperament, so every one we sold is guaranteed to be friendly for its whole life. If you decide that a bunny we raised doesn't have the personality you wanted, you can bring it back and trade it for a free baby rabbit! 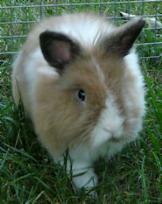 Even though we are no longer selling baby rabbits, we kept a lot of bunnies that are our pets. We still offer a $15 tour of the bunny barn, the tour lasts about 30 minutes and you can bring up to 7 people. If you have any questions, contact us at (804) 556-3377. These fuzzy bunnies are the offspring of a male and female lop who both have a gene for angora fur. Adult Angora Lops weigh about 5 to 6 pounds, but usually look larger than Holland or Mini Lops because of their abundance of long, fluffy hair. Angora rabbit fur is great for crafts such as spinning or felting, but they do require thorough brushing at least once a week, or their fur will become matted. An elegant-looking breed with a lion's mane of long fur around their heads. Typically, Lionheads' manes do not require brushing as they are not long enough to become matted. Lionhead rabbits have short ears that stand up straight, with an extra tuft of fur right between their ears. Their fur comes in a large variety of colors and patterns, but solid colors are more common. 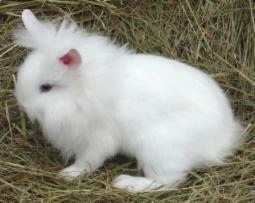 Adult Lionhead bunnies generally weigh about 4 pounds. The rabbits in the pictures are (left to right): Bosco (tortoise shell broken color); Bugs, the blue-eyed white; and Shayna, who is black. Dutch rabbits are usually calm, cuddly, and laid back. Due to their sweet dispositions, they have earned the spot as our favorite breed of rabbit. They are nicknamed the "Oreo Cookie Bunny" because their fur pattern is always white in the middle like an Oreo cookie, with darker bands on the head and rear. 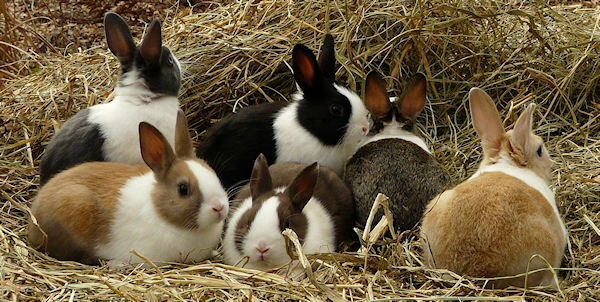 The darker fur can be many different colors, like our bunnies in the picture above. Their colors are (clockwise from top left): blue, black, agouti, fawn, chocolate, and tortoiseshell. 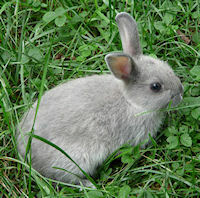 Dutch bunnies stay small (about 4 to 5 pounds), and have straight ears. 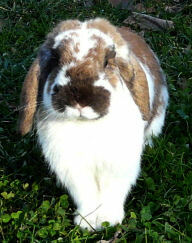 The smallest lop rabbits available. 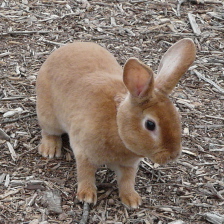 "Lop" means that their ears hang down beside their heads and flap up and down when they hop. Usually quite playful and energetic, lop-eared bunnies love to follow you around and explore new things. They are the classic "Bouncy Bunny", meaning they love to sit beside you, but most lop rabbits do not like to be encapsulated in a hug. Holland Lops are actually smaller than Mini Lops and have blunter faces. Adults weigh about 5 to 6 pounds. They come in a huge variety of colors and fur patterns, from white to black and so much in between! Mr. Leo, shown on the right, is a Tortoise Shell Broken ("Broken" means mixed with white). 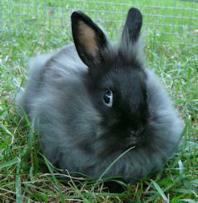 The smallest breed of rabbit in the world, adult Netherland Dwarves weigh only about 2 to 3 pounds. They have tiny ears that stand up straight, and very short bodies. Netherland Dwarf bunnies come in mostly solid fur patterns, or a pattern called "marten", which is a solid color on top and a different-colored stomach. Netherland Dwarf rabbits tend to be energetic, happy, and excitable. All rabbits like to dance, leap, and spin in midair (known as "doing binkies") when you let them out to play, but Netherland Dwarves are champions at it, and they are very fun to watch. The bunny in the photo on the left is Amy, who is a color called sable marten. The middle rabbit is Binky, a black silver marten, and Lobo is the smoke pearl-colored bunny on the right. Mini Rex bunnies have short, extremely plush fur and curly whiskers, and are sometimes called "Velveteen Rabbits". Because Mini Rexes don't have guard hairs (only the soft undercoat), they are not as likely to cause allergies and their shedding is less noticeable. Their ears stand up straight, and they are a small breed, only about 4 to 5 pounds full grown. 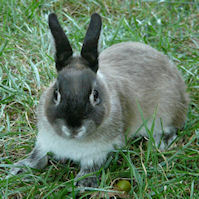 Mini Rex rabbits comes in a large variety of colors and fur patterns. Whiskers, the rabbit on the left, is a color called Fawn. 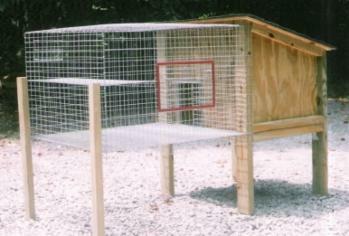 If you need a bunny cage, we have indoor rabbit cages for sale, like this setup on the left. Everything shown for just $99! Click the picture to see our other cages. If you would prefer to keep your bunny outdoors, we have a large selection of maintenance-free, weatherproof rabbit hutches. Click the picture to see more of our outdoor hutches. 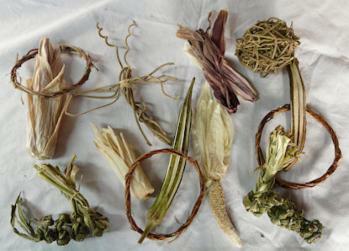 We also produce many all-natural and organic rabbit toys, treats, and accessories. They can be picked up at the Farm, or ordered over the phone and shipped to you. Click the picture to see more of our bunny supplies.